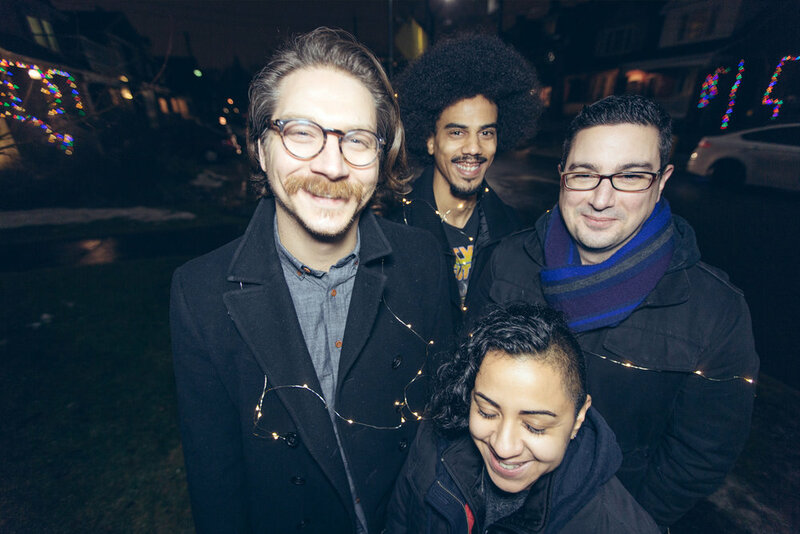 1990future is a Toronto-based, four piece alternative rock band that delivers a tasty punch (POW!) of dirty rock (BAM!) influenced by 1990’s alternative and 1970's rock and pop. There's a taste of Neil Young, The Clash, Weezer, David Bowie, Elton John, The Pixies, and Velvet Underground – basically everyone who is amazing and no one who is not. Featuring Brodie Christ's growly vocals, Mireya Gonzalez on drums, Sean Advent on lead guitar, and Mark Volk on bass, listeners are guaranteed a wall of face-melting guitar (ZING!) and a pulsing rhythm section (OOMPH!). Oh, and good songs too. MUSIC: A full length record, "I Keep Having A Nice Time". A 5-song EP, "Today is the Day", three-song EP entitled “Roll On”, and an original self-titled six-song disc. MUSIC VIDEOS: Stuck with just a shadow is as engaging visually as the song is infectious; the band’s grunting but hopeful side in last year's release, It's Over; and their wry wit and passion for pop culture, notably the video for Youth Curse, which features a lo-fi homage to the ‘chicken scene’ in the iconic Kevin Bacon film, Footloose. Recently 1990future played the wonderfully unique Wolfe Island Music Festival, aside Born Ruffians, Said the Whale, Land of Talk, The Franklin Electric, and more! A mainstay of Toronto rock clubs, they have played over thirty venues, including the Legendary Horseshoe Tavern, el Macambo, Velvet Underground and the Cameron House, as well as NXNE and Canadian Music Week. When they’re not rocking the kids, you’ll find them hanging out in kitchens, ‘cause duh, that’s where the party, and food, is at.